Southwell Community Archaeology Group, a registered charity, was formed 10 years ago to oppose the proposed development of the former Minster School site. The Saracen's Head Hotel, Southwell. The Bramley Room is situated behind the 3 windows on the ground floor to the right of the carriageway. The King Charles Chamber is situated above, identified by the 3 windows also on the right. The Saracen’s Head is situated in the small market town of Southwell. In the medieval period it would have acted as a hostelry for visitors to the Minster but later became a thriving diverse establishment as commercial enterprises developed. It is probable that the present building dates to the mid to late 15th century. Dendrochronology  on the roof timbers show that all 3 wings were rebuilt over a 30-year period commencing in the 1460s. The north range, which runs parallel to Queen Street, was the first phase of construction and has a complex crown post roof structure whilst the south wing, parallel to the north range, and the east range,-both have side purlin roof structures which was introduced at about this time. During the later 17th century or early 18th century the typical timber framed frontage has been rendered over and the jetty has been enclosed. This appears to be in marked contrast to those external walls that overlook the inner courtyard which appear to have been clearly visible to all throughout. It was only during major refurbishment in the latter part of the 20th century that the original external architecture of the frontage was rediscovered, and the hotel took on the traditional black and white timber framed building we see today. Located on the north side of the carriage way, this room originally had a jetty overlooking the market place. All four walls would have been stud walls infilled with the local mudstone inserted into slots cut into grooves in the studs and covered in lime mortar. 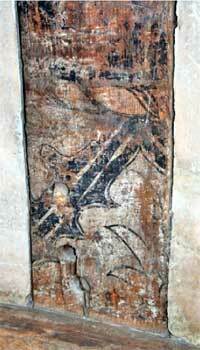 These can still be seen on the north and south walls. Pegs and rectangular holes in the north and south walls indicate that items of furniture or forms were fixed to the walls and possible partition screens attached. The whole would have been lime washed over to give a uniform colour. The wall paintings in the Bramley Room were ‘rediscovered’ during 1995. 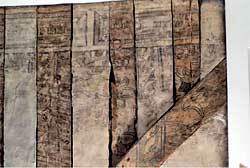 They had remained hidden behind a reed and lime mortar screen applied possibly as early as the early 1700s when wall paintings became unfashionable. 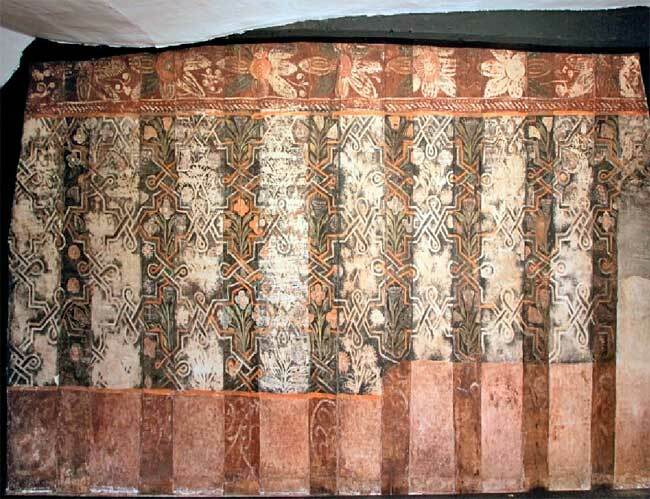 The initial painting on the lower section of the north wall consists of chevrons with floret ogee designs draped over a horizontal pole above the sill plate. Evidence for an earlier painting scheme, probably completed in the late 1500s, is to be found on the lower half of the north wall and is difficult to interpret because it has deteriorated so much, especially on the lime mortar sections. Largely painted in black outline on a white background there might even be two separate paintings. The lower section consists of chevrons with floret ogee designs draped over a horizontal pole above the sill plate. In the middle of the wall there are two angelic faces looking inwards towards each other enfolded in what could be wings or laurel designs. Other than a Renaissance style ‘feel’ there is little resemblance in the styles of these two sections but there is no separation of the two by a dado. There is no evidence for this scheme on the south wall. Wall paintings originated in churches and so initially tended to have a religious theme. When it became fashion in gentry homes to adopt wall paintings the overt religious themes usually disappeared. With the increasing Puritan influence during the later 16th century it would have been safer to have more abstract schemes on walls especially in rooms accessed by the public. This later painting extends to both the north and south walls and would have covered all 4 walls when originally completed. It consists of a frieze and main panel. There is no evidence of the usual lower dado although this is where most deterioration has occurred, either by overzealous cleaning or as a reaction to condensation etc. since this has affected the alkaline lime mortar plaster areas more than the timbers throughout. The south wall showing a section of frieze with its panels and main panel showing the vertical guilloche bands and floral motifs with central nets and circles within two multi-petal floral scroll designs. The frieze consists of imitation 3D panelling all on a red and green background. In the panels there is text in what appears to be Old English Script. The text is very difficult to decipher, with only the words “and thyne”, "and", “awake” and “dreme” being apparent, so further analysis by a palaeographer would be beneficial. The frieze is supported in the main panel by repeating vertical guilloche bands, yellowish spirals intertwined with a white rope on a green background. Between the guilloches are two floral motifs consist of a repeating abstract pattern of nets and circles within two multi-petal floral scroll designs. The background of the main panel appears to be a paler red. Like the Bramley Room, it is likely that the timber studs and mortar were initially lime washed. Peg holes running horizontally across the north wall indicate the presence of a structure fixed to the wall and there is a niche in the top right-hand corner that has been partially filled in. Like the Bramley Room, the paintings were covered over at some point and only rediscovered in the mid-1980s. A photograph taken by A J Loughton, a prolific local photographer in the mid-20th century, shows the north wall of the King Charles room and a Victorian metal fire surround in the centre of the west wall. Both walls are covered in plasterboard . A photograph taken at the time of the rediscovery shows the west wall minus its Victorian black metal fire surround and painted studs and mortar . The original stone fireplace now remains but the central stud has been removed. The painting on the north wall is almost complete but the only remaining evidence of it on the west wall is on the stud adjacent to the fireplace . The paintings would have covered all 4 walls but those on the street wall would have been destroyed when the front of The Saracen’s Head was renovated in the 1980s. It is probable that the niche topped with an ogee arch in the top right-hand corner was partially filled and the original painting covered in lime-wash to give a uniform white colour for the artist to work on. The painting has three sections which is typical of wall paintings of 1550s to 1650s. The frieze at the top is separated from the main panel, in this case by a simple guilloche border, and then a horizontal band of orange separates the dado/skirting and main panel. This later feature is about 1/3rd of the way up the wall and, unusually, curves upwards on the right-hand side for no apparent reason. The Dado is an orange red band which separates the main panel from the painting below. There are no apparent similarities of the two which in itself is not unusual. The painting below the dado is possibly a previous scheme that would have covered the whole wall. It consists of a deep red background with swirls outlined in white lime, reminiscent of the designs found in the Governor’s house (now Gregg’s) in Newark. As in the Bramley Room, the painting on the lime mortar infill has deteriorated more than on the wooden studs. When it was deemed necessary to re-decorate this room, the furniture fixed to the wall precluded painting that part of the wall. The north wall of the King Charles Chamber showing the frieze, main panel and dado. The main panel consists of stylised flowers and fruits within a white and orange-red strap-work on a black background. The strap-work is geometric with twists at the corners. It is well executed in a style which we believe is unique. The flowers, which could be lily or thistle type, are painted white, orange red, green-yellow and blue-green. Fruits resembling strawberries are on the outside of the strap-work. Some of them are painted half black and red, a crude attempt at depth. The frieze continues the fruits and flowers theme. The background is dark red, probably red ochre with white, orange-red and blue-green pigments used for the fruits, possibly strawberries and pomegranates, and flowers. The background is dark red with white, orange-red and blue-green pigments used for the fruits and leaves. The blue-green pigment fluoresces under UV light which possibly means it is copper based. This is a more expensive pigment and reflects the high status of The Saracen’s Head. The horizontal guilloche band is quite common and consists of twisted dark red and white ropes with a line of white teardrops above and below. A thin orange-red band separates the frieze from the main panel. This is a very striking design, especially as indications are that it went all around the room, and one which clearly shows the high status of the owner. The wall paintings in the Bramley Room and King Charles Chamber of The Saracen’s Head are attributed to the late Elizabethan era- c.1580-1600. Many examples exist throughout the country but few in Nottinghamshire. The strap-work design of the King Charles Chamber appears to be unique in style as do the vertical guilloche bands in the Bramley Room. There are some small similarities to well documented paintings in other parts of Nottinghamshire such as the strawberries which can also be found in the Governor’s House in Newark. We still await the results of scientific analytical work carried out on the samples of the paint work so that pigments and medium can be identified along with possible stratification. We are grateful for the support that we have received from Dr Andrea Kirkham, the staff of Bradford University and Dr Chris Brooke for their interest, contribution and encouragement which have inspired the team of Southwell Archaeology Group to pursue this project. We are also extremely grateful to The Thornton Society of Nottinghamshire for their encouragement and financial support through the Geoffrey Bond Research Award (1917/18). 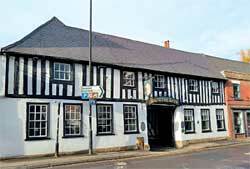 We are also thankful for the interest and support given to us by the staff of The Saracen’s Head Hotel.